Brimble is a Twister. She was designed by Kim Holman, moulded by Tylers and then fitted out by Uphams. Brimble was launched in 1972. She is a diminutive 28ft long, but fast and incredibly sea worthy. Over the last 12 years we have sailed about 15,000 miles. Brimble has no running water, no radar, no outboard motor, no hot water, no oven, no fridge, definitely no shower, only two sea berths and a 25 litre fuel tank. For a year we lived on her, 2 adults and 2 children. You can see from the map below that our trips so far have included a couple of passages over to Norway and across the Atlantic to the West Indies and back. More recently we sailed up the West Coast of Norway into the Arctic then back down south to the Shetland Islands then to the west Coast of Scotland via the Caledonian Canal. Having completed the infamous Scottish Isles Peak Race we then continued south along the east coast of Ireland and then hopped over to the Scilly Isles, along the south coast to end up back where we started at Shotley Marina. Last year we reaquainted ourselves with the East Coast and enjoyed a short trip over to Amsterdam and the Markemeer. This year we completed Brimbles refit and have just finished a lovely sail over to North France and back to Southampton where we will stay for the Winter. We're thinking back up north ... the sailing in England is just so busy. Booking marinas is becoming the norm and sailing is not quite such an adventure when you are surrounded by thousands of people. We hope this blog proves that you don't need a big boat to do big sailing because we've done it and loved every minute of it ... well, most minutes anyway ... there were a few moments when we were a bit underwater, which .. well, read the blog. We started the blog as a way of staying in touch with friends when we did our trip over to the West Indies. Having started, it just seemed a pity to stop, so we didn't. We've written up pretty much all the passages we've made in the 'Voyages' page - some are quite exciting but most of them are what we all get up to every weekend and summer holiday. You can access each passage by clicking on the drop down menu above. Or, if you have time on your hands work through the whole blog by clicking on 'older posts' at the foot of each page until you lose the will to live. A few of us are devotees of small boat sailing. The idea of doing trips that have been reserved for grown-up boats like Oyster, Najad, Rassy and Bowman really appeals. The statement ... 'oh you couldn't do that in a small boat' is an irresistible command! There are lots of small boats doing amazing things. Brimble's friend Pouncer (28ft) has just done a circumnavigation of Scandinavia; Sumara of Weymouth (25ft)) has sailed up to Spitzbergen as well as Iceland and Jan Mayen and so the list goes on. These are not hardy adventurers but normal people who just made the last step that life often conspires to stop being taken. If you're not convinced by this Blog that small boat sailing is cheaper, easier and just as much fun then check out some of the adventures of the famous 25ft wooden Vertue, Sumara of Weymouth (see the drop down menu above) and her owner Alasdair Flint. Despite such luxury it would be fair to say accommodation is compact and if your not intimate when you start a trip you surely are by the time you finish! Living on board for a year was fine with two small kids but it was dependent on being able to be outside most of the time. The photo below is of Jack and Ella with a couple of friends in the forepeak! What's the right size of boat? The big question I guess we all ask is what is the right size for a boat. My personal view is 28ft but then I'm a bit biased. I think it would be fairer to say that a boat bigger than say 32 or 33ft adds little value in space and a shed load more worries when you come to park. Maintaining smaller boats is easier because there's less boat to maintain and less stuff to worry about. I accept the point that when it gets rough it's more comfortable in a bigger boat and of course you can keep going longer when you're into the wind. But hey, it's not a race so I think I would rather go a little slower and use a little patience. At sea we only have two sea berths and so we hot bunk with more than two of us. On Brimble four is definitely a crowd because you cant sleep three people so actually you stand longer watches (2 on, 2 off)! The photo below shows pretty much the whole boat. For long passages we use the forepeak entirely for oilskins, sails, food and spare water ... as you can see. Two sea berths either side with good sturdy lee cloths to stop you falling out. We have a twin hob cooker and grill and then we also have an Ovni oven that sits on the hob .. It sort of works! On the foreground on the left hand side of the picture is a navigation table. You can see our electronics in the video below. We have made many long passages in Brimble including a single handed Trans Atlantic. 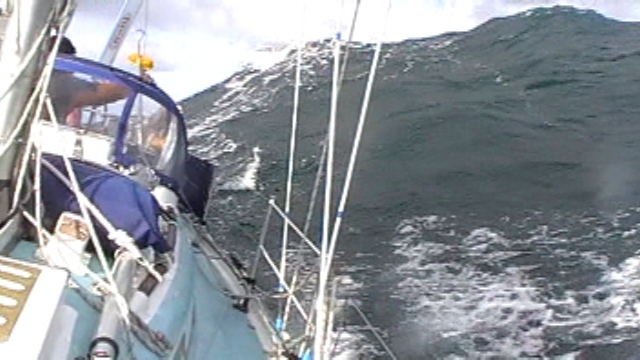 Inevitably when you are at sea for more than a few days there is a risk of bad weather. For us the first question is not wind strength but wind direction. Anything more than a Force 7 on the nose and we cannot move forward and even in several Forces less the good ship operates largely underwater. So in these situations the best bet is to hove-to under triple reefed main and storm jib - as you will know the impact is transformational. We have hoved-to in The Biscay and North Sea on a number of occasions and each time the only question was why we left it so late! She is comfortable up to a full gale with this set up. Going down hill is a lot easier and we can carry on sailing up to a gale. With the wind behind us it tends to be more the sea state that dictates the tactics. The good ship does twist around a bit but even in large seas she's pretty dry. One of the advantages of a small boat is that in rough weather there are always plenty of hand holds within easy grasp and everything you can grasp is solid and can hold the weight thrown at it .. if it couldn't it would be broken by now! Heading off into the sunset - should I or shouldn't I ? I have sailed to Iceland several times, to Norway, almost to Greenland, Spitzbergen, across the Bay three times, to the Faroe Islands, pretty much the length of the Med and across the Atlantic four times. I have taken two career breaks and some periods of extended leave. So, good decision or bad? The answer for me lies in the answer to the question of the most vivid moments in your life. For me, putting to one-side deaths, birth and marriage all of those key memories are on small boats having adventures. So, if you're hesitating, my recommendation is to absolutely go for it - you will undoubtedly wonder what the hell you're doing at times but you will never regret it. What you don't know you pick up on the way; if you can't afford things make do with what you have; when you have planned for food, water and navigation then beware the prevarication .. always remember that the toughest part of any voyage is leaving port - you can always turn round! You will always encounter a boat with less than you have and many with more than you have but it won't make any difference to how much you enjoy the adventure. When Selma and I set of across the Bay the first time we had to turn round after a few hours because the mainsail ripped in half. We went back, Selma sewed it up over night and we left the next morning. No worries. As I left Crown Point marina in the Virgin Islands to sail back across the Atlantic on my own I realised that it was the first time I had ever sailed a boat on my own! You can definitely over-plan and over analyse. Sometimes it's best to crack on. I have tried to share some of the equipment we use on the good ship in the Technical and Good and Bad sections - see drop down menu. Of course these are based on personal experience; but they are real personal experience and if something works on the good ship for any length of time then the chances are it will work anywhere! This little video was taken a few years ago one evening as we cruised up the west coast of Norway.